Iraqi Migration Minister Takes Europe by Storm! Rev. Ken Joseph Jr. The New York Times reported on 7 December that in a classified cable received from the CIA's station chief in Baghdad it was noted that the security situation in Iraq was expected to deteriorate further unless some major successes are achieved. This is bad news for President Bush who has on the top of his holiday wish list successful elections on January 30. The President believes that next month's elections will be the beginning of a new era in the transformation of Iraq into a democratic and free nation-state. On the contrary, many in Iraq and in America do not share this view. With the lack of total participation of any one of the four major ethnic or religious groups in Iraq, the elections in January may engender a climate better suitable for anarchy due to a weak central government and finally in an all-out civil war. A civil war inside Iraq will prompt Turkey and Iran to move in and cross their borders into Iraq, in an effort to prevent any spillover onto their own territories. At that point, no additional U.S. troops may be able to combat the chaos in every corner of the country and decades-old acrimonious revulsion between two or more ethnic and religious groups will ablaze Mesopotamia. To create some sense of stability before the elections – highly improbable to occur within the next six months – the U.S. government can cut its losses by transferring its security role to the regions which can be expected to share power within a national legislative framework. The “Kurdish Model” has given the Central Intelligence Administration analysts an angle on what an Iraq with three similar semi-autonomous regions can look like. The brown-shaded areas in this and the next map cover the administrative unit claimed by the ChaldoAssyrian lobby in Europe and North America. Graphical representations courtesy of the Assyrian International News Agency. With the recent bombings and increasing anti-Christian sentiments in all these three regions and the brutal murders and acts of intimidation occurring weekly in Mosul, Baghdad, and Basra, the attention of Washington, the European Union, and now Vatican has turned to the formation of an additional semi-autonomous region, that of the ChaldoAssyrians in the Nineveh Plains. Demonstrating an exalted sense of democratic values, Iraq, with Baghdad as its multi-ethnic center, may soon comprise of three Islamic and one Christian semi-autonomous regions, divided further along ethnic and tribal groups. True to its historic identity, Mesopotamia will once again become a bastion of religious and political parities, sharing a renewed role as a responsible member of the world community. But do Shiites and Sunnis share the same sentiments as the Kurds and ChaldoAssyrians? On Monday about 600 leaders from Iraq’s Shiite provinces in the south announced plans to begin setting up their own autonomous region. Representatives agreed to set up a security committee for their five provinces and a regional council to stimulate the economy of their neglected region. These are the provinces of Babel, Qadissiyah, Muthanna, Najaf and Karbala. "We must turn ourselves into a regional unit in the context of a federal Iraq," said Ukail al-Khozai, deputy governor of Karbala. The Shi'ite majority wish to see their power reflected in their sheer numbers; some 60 percent of Iraqi population is Shiite. The Sunnis in the central region fear a tyranny of the Shi'ite majority and are least interested in a regional semi-autonomy. The Kurds have already formalized their semi-autonomy with the elections for their regional parliament on the same day as the National Elections. Sunnis are soon expected to voice their desire for a semi-autonomous region in and around the Sunni triangle. This leaves little time for the Christians of Iraq to mobilize in preparation for the granting of their limited autonomy in the north. negotiate with Washington, the Hague, Baghdad, Tehran, Ankara, Damascus and Amman in appealing for an administrative region for the protection of nearly two million Christians and ChaldoAssyrians in Iraq. Enter Mr. Yonadam Kanna and Minister Pascale Warda. Mr. Kanna, representing the general interests of the Iraqi people and specifically the welfare of the Christians in that country traveled to Syria and Jordan last week and made a crucial announcement in ensuring greater protection for Christians around the Mosul area. In an interview reported in our last issue, Mr. Kanna explained that a force of 1,500 ChaldoAssyrian fighters was on its way to Mosul to protect the Christian civic and religious centers. 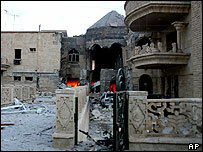 In only a few days after this announcement two Chaldean and Armenian churches were attacked in Mosul, emphasizing the heightened tension between ChaldoAssyrians and the anti-Christian elements in Iraq. Zinda Magazine has learned that as many as 10,000 ChaldoAssyrian fighters are prepared to swiftly move into ChaldoAssyrian towns and villages and protect the entire Nineveh Plains around Mosul, and the cities of Baghdad, Kirkuk, and Arbil. More fighters will be needed to secure a stable area in and around the Plains of Nineveh. Mrs. Pascale Warda, Minister of Immigration and Displacement, met with the European Union ministers in the Netherlands and local officials in that country to emphasize the threat against survival of the Christians in Iraq. See this week’s The Lighthouse for a comprehensive report on Mrs. Warda’s mission to the Hague. 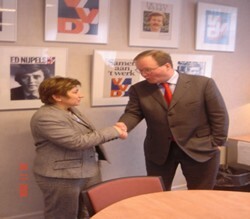 Minister Warda was instrumental in guaranteeing the support of several influential members of the Dutch Parliament and the EU in her appeal for the safety of the Iraqi refugees and the recognition of a safe haven for Iraq’s ChaldoAssyrians. After security and immigration, the third ingredient for a successful implementation of a “ 3 + 1” arrangement of power-sharing in Iraq, namely negotiating a territory around Mosul (ancient Nineveh) that will oblige the full political participation of the Assyrians in the West, Iran, and Syria. 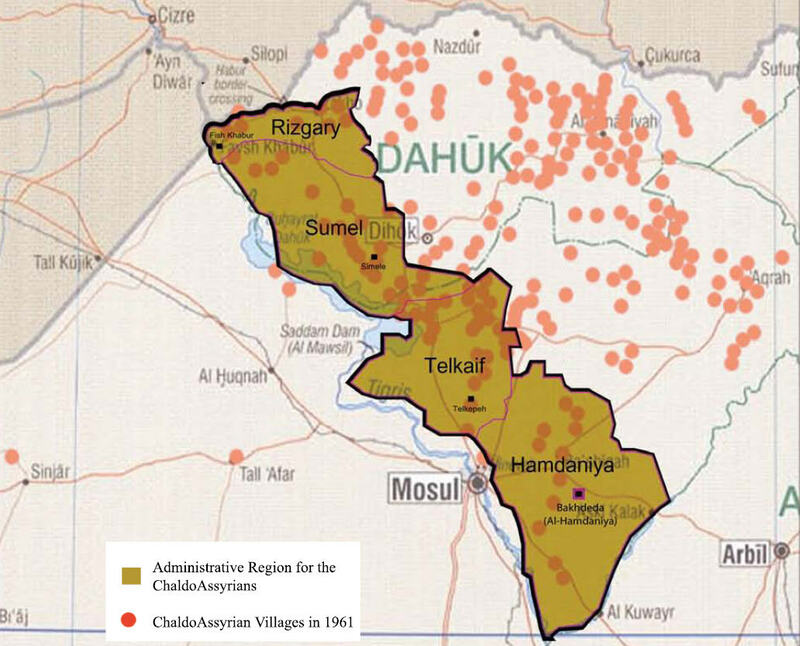 Demand for a safe haven in the past should now be transformed into demand for a regional administration in the Nineveh Plains– a semi-autonomous area much like the Kurdish semi-autonomous region in the north. This arrangement should be equally and fairly applied to the Kurdish, Shi'ite, and Sunni groups, as well as the ChaldoAssyrians. Only when the internal tensions between the ethnic and religious groups has subsided and the occupational forces have diplomatically evaded any danger of a civil war, the parliamentary elections within each region and for a national assembly can be expected. Ironically, with every explosion inside the Christian churches the defenseless ChaldoAssyrians of Iraq have come another step closer to witnessing the creation of the Little Bet-Nahrain. It is a price paid in blood and sweat. Assyrians are now moving in a difficult path to rendezvous with what was once thought as impossible, a door which opens itself to astonishing possibilities only once in a century or more. With events occurring at such incredible speed soon we may indeed find ourselves standing inside the doorway. The challenge is to remain inside the room, demanding our rights as the "+1" to complete the mosaic of a free Iraq, until all guests have left the house - the house that had always belonged to its rightful Assyrian owners. Iraqi Migration Minister Pascale Warda Takes Europe by Storm! Minister Pascale Warda, the Iraqi Minister of Immigration and Displacement and an Assyrian Christian, had a whirlwind tour of Holland. The Dutch premier, Jan Peter Balkenende is the current president of the European Union and Holland currently chairs the EU institutions. Invited by the Dutch Government and in particular Minister of Immigration, Rita Verdonk, Minister Warda held a series of meetings with the Immigration Service to discuss the fate of nearly 5,000 Iraqi refugees in Holland who comprise the largest number of refugees in the country. "We need the countries of the world to understand our situation in Iraq and to welcome for the time being those from our country who are in yours until the situation stabilizes. The worst thing to do would be to have them come back at this time before we are ready to accept them." "In particular we are concerned about the current transitional constitution and in particular article 7 which states that 'Islam is the religion of the state', the electoral system and reconstruction. We are deeply concerned at reports that little if any of the nearly 180 Million Euros being provided by the European Union is being received by the Assyrian Christian community in Iraq due to discrimination on the ground against non-moslems. If it was up to me 50% of all funds would go directly to the Assyrian Christians and the other minorities to balance the current situation, but we will try to have at least 10% be itemized in this way. As the European Union which has just debated and settle the concept of a secular European Constitution we must demand that the Iraqi Constitution be secular and the rights of all peoples be protected." Following the discussions with the EU a series of meetings in the Dutch Parliament were held with Christian Union (CU)'s Ms. Huizinga, the Christian Democratic Appeal (CDA)'s Mr. H. Ormel, People's Party for Freedom and Democracy (VVD)'s Mr. Van Artsen and Mr. Verbalen, and the Labor Party (PvdA)'s Mr. Bert Koenders, Mr. Kris Douma and Ms. Mevr. Huizinga. Left Photo: Minister Warda and Mr. Verbalen, a critic of non-Western immigrants in the Netherlands; Middle Photo: Minister Pascale Warda speaking with CDA's Henk Ormel; Right Photo: On air with EO Radio's M. Vrij, speaking in Syriac to the largest radio audience in the Netherlands. The central issues discussed with each by Minister Warda, supported by the Assyrian Christian staff, Ms. Attiya Gamri and Rev. Ken Joseph Jr., were the situation of the Iraqi refugees in Europe, the concerns for a secular constitution, the upcoming election and what is known as the "Five R's" for the Assyrian Christians in Iraq - Reconstruction assistance, Resettlement of displaced persons, Regional Administration, Registration for the upcoming election and Regional Security. PvDa MP Kris Douma asked pointedly "Are the Assyrian Christians safe in Iraq? Can the elections go forward as currently planned? MP Bert Koenders was very clear with his comments "A secular constitution with no mention of religion or ideology as originally requested by the Iraqi Governing Council is an absolute must if Iraq is to enjoy the support of the world community and the European Union in particular." "Frankly, I was and continue to be shocked and outraged at the treatment of the Assyrian Christians in Iraq not only during the time of Saddam but now. The fact that little if no assistance is reaching the indigenous community of Iraq and the constant intimidation that has resulted in the departure of nearly 40,000 people must be stopped immediately. Even during the time of Saddam Hussein the community suffered under Kurdish Control as well in the north of Iraq - their ancestral homeland. In my position in Government I will do all I can working together with the European Union and the Dutch Government to make sure all assistance is conditional on a free, democratic and secular government in Iraq." Islamic state like neighboring Iran and that the future constitution be secular said aide Ken Joseph. Following the presentation of Minister Warda, Ms. Huitinga of the CU Party said "If the Kurdish people can have a Kurdish Regional Government there is no reason the Assyrian Christians as the original people of Iraq should not too. This is a position we can support." From L to R: Ms. Attiya Gamry, Minister Pascale Warda, Ms. Mevr. Huizinga from PvdA & Rev. 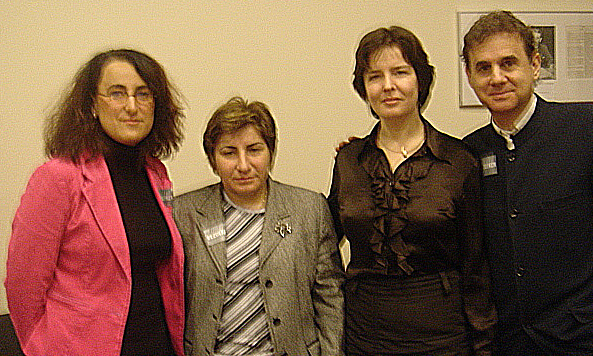 Ken Joseph Jr.
All told the whirlwind two day trip of Minister Pascale Warda to Holland touched the Iraqi expatriate community giving them hope for their future and a good agreement to protect the rights of all those in the refugee community, the EU which had many of their concerns confirmed and a path forward outlined and the Dutch Government which holds the current EU Presidency. In February a similar conference will be held at the invitation of the Swedish Parliament featuring Ozcan Kaldoyo, Yahkob Rohyo and Rev. Ken Joseph. In addition discussions were held with Assyrian Christian Groups and the Iraqi Government concerning the requirements for voting for overseas Iraqis. Minister Warda, as the minister in charge, is finalizing the requirements and in conjunction with the Iraqi Government and Overseas Assyrian Christian groups preparations are being made to compile all the requirements and create a system for registration for those living overseas. The system is expected to be up in a few days at www.assyrianvote.com which will list all the requirements for voting, a voting procedure and help for those needing assistance with specific items. In general those with an Iraqi Passport - expired or not - or any form of Iraqi Government ID can vote. Those without must have some form of local ID from their village at the time of voting. 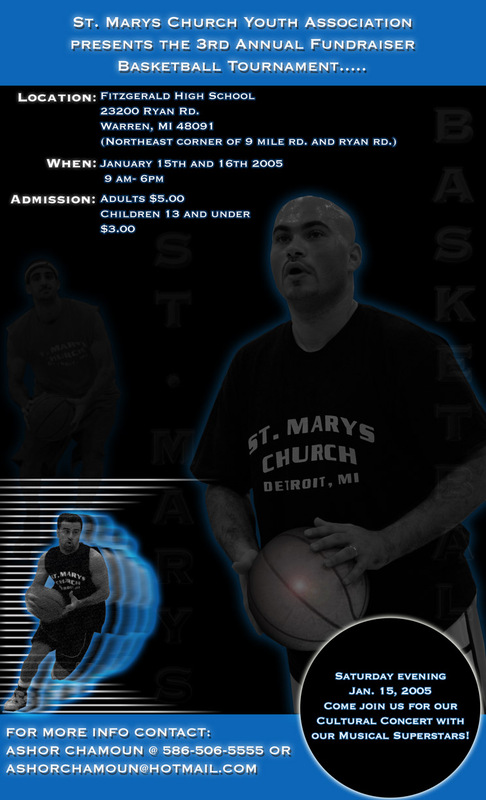 Details will be posted on the site as they become available in English and Assyrian and all assistance will be provided by this joint effort to register as many Assyrian Christians as possible. "I think we accomplished what we set out to - first to negotiate a favorable arrangement for the Iraqis in need here in Europe and then to let the EU and the Dutch Government and people know the situation of Iraq. Now is not the time for empty words and promises but for concrete action and leadership on the part of the European Union and the Dutch Government for Iraq. We need help now - not tomorrow, not next week or next year." 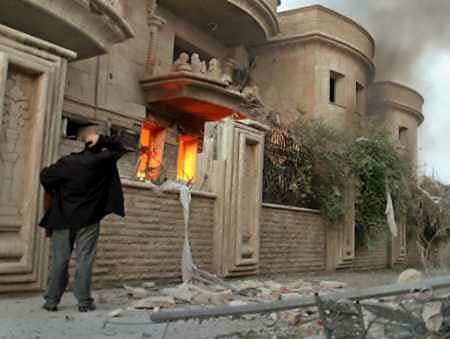 (ZNDA: Baghdad) Militants detonated bombs in two Christian churches in the northern city of Mosul on Tuesday, destroying the sanctuaries in the latest of a string of attacks seemingly intended to stir religious and ethnic divisions. No one was killed in the attacks, witnesses said. In Mosul, where insurgents have waged a brutal campaign against Iraqi security officers for a month, American and Iraqi soldiers have detained more than 230 suspected insurgents in the past week, military officials said. The first of the church attacks took place on Tuesday afternoon in the northeastern part of Mosul when about 20 insurgents planted bombs in the sanctuary, forced three monks to leave and detonated the explosives from outside, witnesses said. A second church was bombed in the northern part of the city later in the day. Most Iraqi Christians are Assyrians, who belong to an independent Christian sect, and Chaldeans, Eastern-rite Catholics who recognize papal authority. 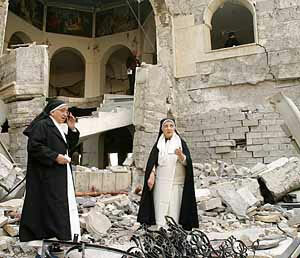 The bombings were not the first strike at Christians, who constitute less than 5 percent of Iraq's 24 million people. On 8 November, car bombs exploded almost simultaneously outside two Christian churches in southern Baghdad, and that night a third bomb exploded outside the emergency room where most of the wounded had been taken, killing at least one and wounding dozens. On 1 August, militants carried out five coordinated car bombings of Christian churches in Baghdad and Mosul, killing 12 and wounding dozens. Iraqi political figures and Muslim leaders condemned the attacks. But many Christians in Iraq remain deeply uneasy about the rise of fundamentalist Islam here since the fall of Saddam Hussein, and thousands are believed to have fled the country. (ZNDA: Baghdad) Last Thursday His Beatitude Mar Emmanuel Delli, Patriarch of the Chaldean Catholic Church, called on the members of the Kurdish parliament to reverse an earlier decision and recognize the “Assyrians and Chaldeans” as one people and identified under a single name. Sources to Zinda Magazine in Baghdad report that the Kurdish leadership in north Iraq has accepted the request from His Beatitude and reversed its decision by which the ChaldoAssyrians were to be listed as two separate groups in the Kurdish Parliament. As reported last week in Zinda Magazine, the Assyrian Democratic Movement objected to the binomial representation of the ChaldoAssyrian people in north Iraq and refused to join the Kurdish parliamentary elections in January. The increasing pressure from ADM’s central office in Baghdad and the office of the Chaldean Patriarchate last week obliged the two main Kurdish parties to accept ADM’s demands. However, as Zinda reporters in Suleimaniyah indicate, of the 5 available seats for the now “ChaldoAssyrian” constituency in north Iraq, only 2 may be occupied by the ADM candidates and the remaining 3 will be allocated to other ChaldoAssyrian and Christian parties. Furthermore, the three seats set aside for parties other than ADM will be presented on a “Kurdish List”, most likely pre-approved by Massoud Barazani’s KDP. To date these groups have been identified as the Chaldean Democratic Union Party (CDUP) under Mr. Abd al-Ahad Afram, the Chaldean Cultural Society (CCS), Bet-Nahrain Democratic Party (BNDP) under Romeo Hakkari, and the Assyrian Patriotic Party under Mr. Nimrod Baito. (ZNDA: Damascus) In the opinion of Mr. Yonadam Kanna, Secretary General of the Assyrians Democratic Movement, it would be a mistake to hold the elections on 30 January if security was not established first. "To have the election," he stated, "is associated with the presence of a safe and appropriate political environment that allows all people who make up the Iraqi society to participate in the elections. If security was not achieved by election time, then it is a mistake to have the elections." He added that Iraq is one electoral district and that "we cannot have elections in one region without the other because representation in that case will not be balanced. Therefore, we even are going to have the elections in all regions of Iraq or not have it at all." Mr. Kanna stated that "we do not want the permanent occupation by foreign forces in Iraq; however, we cannot ask these forces to leave Iraq now without a other security forces to replace them. The departure now will leave a vacuum that could cause a tragedy and disaster, even a civil war. Iraqis need the coalition forces today and we, as sovereign Iraq, will decide when these forces should leave. We will ask for the departure of the coalition forces when Iraq establishes its army, security police (inside the cities and its highways), and at Iraqi borders. Only then, the lingering of the occupation, which by the way we do not refer to it as such, is no longer needed." In connection with the position of certain national and patriotic Iraqi political groups, which are not part of the political system, from the elections, Mr. Kanna stated that "we as Iraqi parliament, government, and political organizations are negotiating with these groups." He stated that "we are trying to convince these groups to join us in the political system where there are many within and without the government that are calling for the postponement of the elections and to prepare for the suitable environment around which elections could be held. We hope that these groups will share with us in rebuilding the new Iraq and the writing of the new permanent constitution." (ZNDA: Mosul) Displacement of certain ethnic groups from a dense area to less populated areas within Iraq was a powerful tool employed by Saddam Hussein's regime to minimize concentration of any ethnicity within a specific district in north and south. This treatment was especially applied to the Christian in north Iraq. 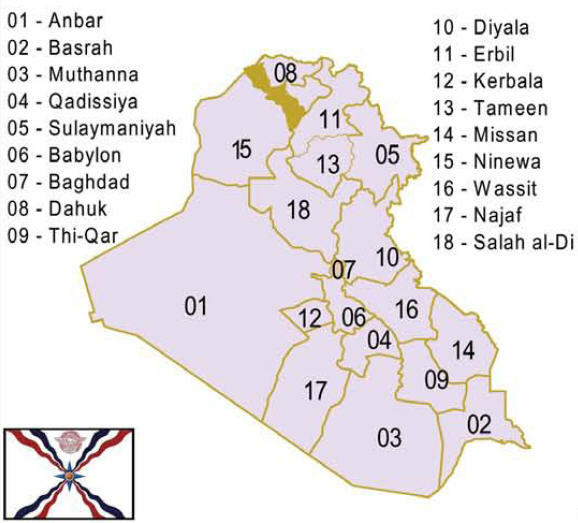 In an effort to return the lands and properties wrongfully handed over to Iraqi citizens by the former regime in Iraq, the office of Registration of Land Deeds in the al-Hamdaniya District has requested from the Municipal Office a list of names of the non-natives who had been granted lands in towns like Bartella. There are as many as 700 land parcels in Bartella alone that could be returned to their rightful ChaldoAssyrian owners . The current owners of these lands were rewarded these properties in accordance to Decree 117 of the dissolved Ba'athists Revolutionary Command Council. They are neither natives of the town of Bartella nor of al-Hamdaniya District. The aim of the past Ba'ath regime in towns such as Bartella was to end cultivation of the agricultural lands belonging to the Syriac-speaking Christians of Bartella in favor of building residential homes for the supporters of the regime. This was in line with the regime's Arabization policy and changing of the demographic landscapes of such towns as Bartella. The Iraqi Governing Council Decision No. 50 issued on 29 September 2003 abolished all decrees issued by the past regime. The people of Bartella are asking the Governor of Ninawa (Nineveh) and all other government officials to suspend these practices. (ZNDA: Baghdad) John Paul II expressed his closeness to Iraqi Catholics shaken by two new terrorist attacks which destroyed an Armenian-Catholic church and the Chaldean bishop's palace in Mosul. 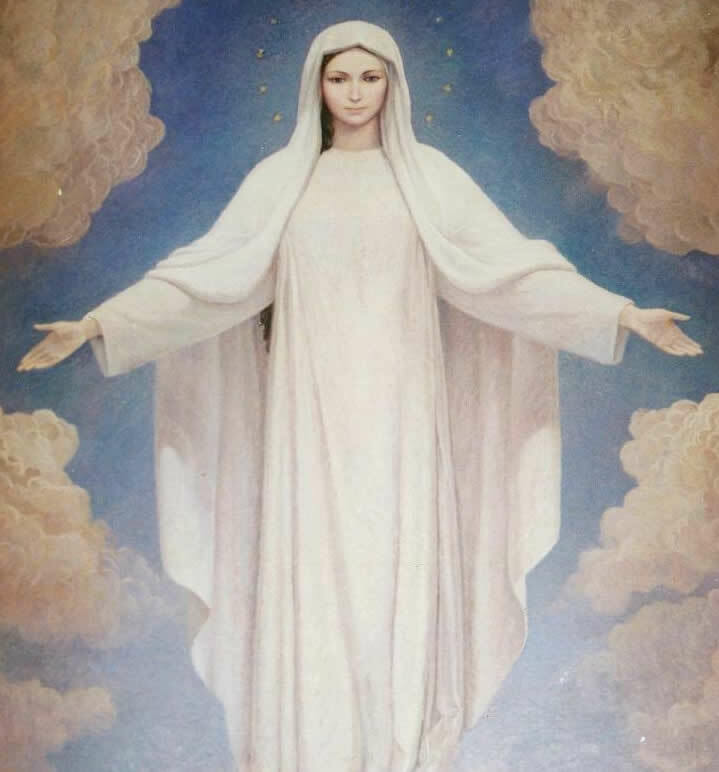 "I express my spiritual closeness to the faithful, distressed by the attack, and I implore the Lord, through the intercession of the Virgin Mary, that the Iraqi people may at last know times of reconciliation and peace," the Pope said today after praying the Angelus on the solemnity of the Immaculate Conception. On Tuesday, attackers entered the Armenian Catholic church in the Wihda neighborhood in the eastern part of the city. They forced out a security guard and two other people who were there and then set off two bombs, according to eyewitnesses. Around 4:30 p.m., a group of four or five armed men stormed the Chaldean bishop's palace on the right bank of the Tigris River. Archbishop Paulos Faraj Rahho, 62, was away on pastoral duties. The only person in the building was Father Raghid Aziz Kara. He told AsiaNews that after the attackers ordered him to leave the premises, they proceeded to lay and then detonate explosive devices. He heard three explosions and saw the building engulfed in flames. The nearby Church of the Purification, which Muslims also venerate because of its famous statue of Our Lady, was untouched. Police were investigating. Archbishop Fernando Filoni, apostolic nuncio in Baghdad, told AsiaNews that the attacks against the bishop's resident and the Armenian Catholic church are "grave and cowardly acts against defenseless Christian symbols and institutions." The nuncio said that the Armenian church "was supposed to be inaugurated on Christmas Day." The attack against it shows "how little respect terrorists have for people and holy places," he said. 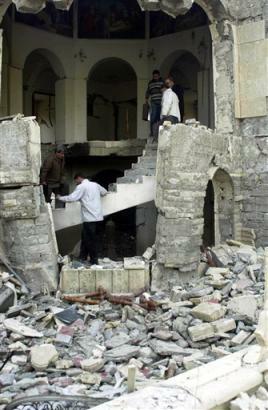 He said that the bishop's palace in Mosul had been receiving threats for some time. "Today they became a reality," he noted. In reference to U.S. action in Fallujah, Archbishop Filoni said that terrorists promised "they would destroy a church for every mosque that was attacked. But all these acts stem from an exasperated violence that especially strikes those who are defenseless." Recently at a social gathering the subject of helping needy Assyrians back home came up, so everyone chipped their two cents worth from their own perspective. I was surprised to learn that many shared my views on the issue of Assyrians squandering their money in these blessed United States forgetting that thousands of Assyrians are suffering daily in Iraq. Just before my return from Iraq last December, I was able to visit with a few families in Baghdad, and apart from security issues, their major concern was whether they will have enough to survive come next week, as conditions were constantly deteriorating around them. Since I got back from Iraq and specifically after the church attacks, it is estimated that 40,000 Assyrians left Iraq, and the living conditions have progressively gotten worse. The only cousin that I had left there has since left to Syria, she says she was one of the lucky ones that could afford to get out and rely on her relatives overseas for her family's daily needs. I heard horror stories of what some families in Jordan are doing to survive daily, similar stories were echoed from Greece and Italy. My message to all Assyrians alike in this blessed country, is go ahead spend, have fun, live things up, but please never forget your brethren back in Iraq. Millions of people support local organizations in these United States. 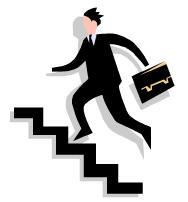 These organizations fund various activities and charities nationwide. There are only few thousands of us Assyrians here out of whom only few hundreds are actively supporting our own people back home, we ALL need to get involved. Please do your part and donate proportionally and fairly to those who need your support the most. You can start today by E-mailing: AssyrianAid@MindSpring.com or by calling: (408) 885-0705. Please join the World Affairs Council of Northern California and the Commonwealth Club in welcoming His Majesty King Abdullah II of Jordan to the San Francisco Bay Area. His Majesty will discuss recent developments in the Middle East, the potential for renewed peace negotiations, and the impact of the war in Iraq on the region and the Kingdom of Jordan. Advanced Reservations required. Please call 415-293-4600 or e-mail: registration@wacsf.org. This event is sponsored by the World Affairs Council of Northern California and the Commonwealth Club. Thank you! Your response to our Friends of Nineveh Christmas drive was so great that we decide to expand our original goal to cover other villages that needed our help. To see how well we have done, please go to the following link (click here) and “check our fundraising status”. We are going to keep the drive until the end of the week. Please feel free to check on the status of the drive any time and check frequently to see how we are doing. 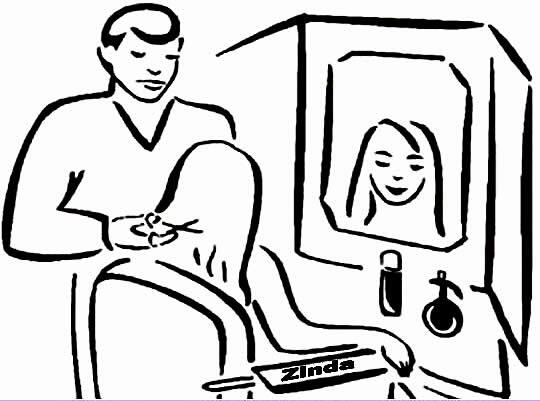 In reference to the article posted by Professor John Joseph, on Zinda Magazine, 18th of October, 2004. 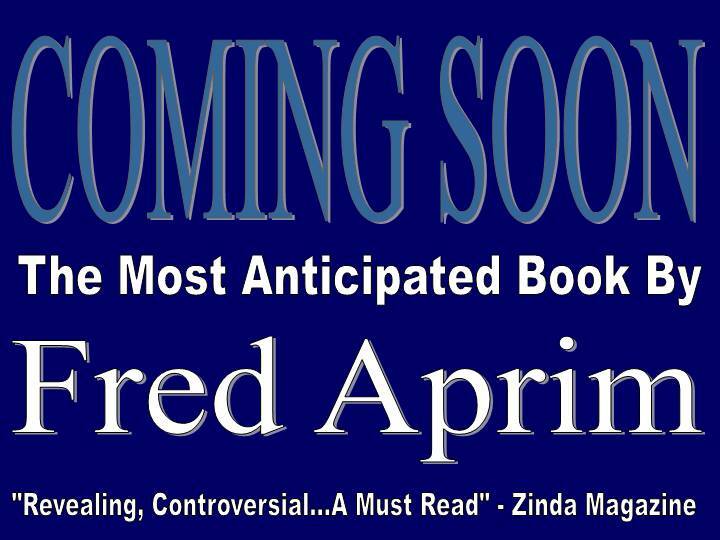 Professor Joseph, in his above mentioned article, criticized Mr. Fred Aprim for “misrepresenting” his source, the book Hagarism, by the authors Patricia Crone and Michael Cook. The purpose of this article is to analyze the book Hagarism, in “context”, and to draw conclusions as to the intentions or beliefs of the authors of the book Hagarism. This article will not be involved in the Joseph-Aprim argument; instead, it will try to assess the role of the book, and its authors, regarding the Assyrian identity. With regard to the question of Assyrian identity, the critical part of the book runs from page 54 to 102. Within this span, this writer was able to count 42 instances where the authors of the book mention Assyria and Assyrians. The so to speak “contradictory” statements are in pages 63, 83, 87, 102, plus the Notes. To analyze and understand the intention of the authors regarding the Assyrian identity, a few of the representative statements will be quoted, and analyzed. Here the authors clearly believe in the survival of the Assyrian and the Babylonian identities and cultures. The Assyrians survived under a Christian aegis. When the authors write that “both identities nonetheless survived”, the answer to the question who were the surviving identities is a few lines above, namely, the Assyrians and the Babylonians. Nevertheless, one might argue that by Assyrian, the authors are referring to Arameans living in Assyria, and call them Assyrians in a geographical sense. Because at the time of the Assyrian Empire the common language was Aramaic, it is difficult to distinguish between Arameans and Assyrians, and it would be unscientific to arbitrarily decide upon the survival of Arameans only. Therefore, at this point, one has to accept the fact that by Assyrians, the authors simply mean Assyrians. The question of Aramean identity must be deferred to the lines that will follow. There is no doubt in the meaning of the above lines that “Assyria” came back with an “Assyrian” self-identification, that the state of Adiabene was an expression of this self-identification. In note 67 of the above quotation, printed in page 189, the authors mention the continued use of the old Assyrian names. Why are the authors stating that the region came back with an Assyrian, not Persian let alone Greek, self-identification, while they could have stated that the region came back with an Aramean self-identification? Were these people of Adiabene, for whom the temple of Ashur was restored, and were using old Assyrian names, exclusively Arameans? If so, what was their glorious past as Arameans? Why were they claiming an Assyrian self-identification, and not an Aramean one? Were these people a mixture of both Arameans and Assyrians? If the Assyrian identity survived, as was affirmatively stated above by the authors, wouldn’t it be more logical to believe that both Arameans and Assyrians survived, rather than only the Arameans or Assyrians, alone? 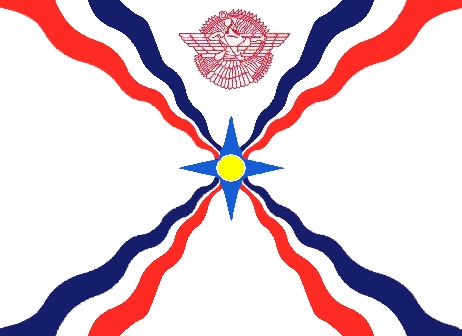 If the Assyrian name was claimed, it also means that the Arameans had accepted the Assyrian identity. In the above quote, the authors explain how the Assyrians insisted on maintaining their genealogy. Was this genealogy Assyrian or Aramean? If Aramean, then why did they insist on an Assyrian genealogy? If Arameans had accepted the Assyrian identity, then, how is it possible to distinguish between Assyrian and Aramean? 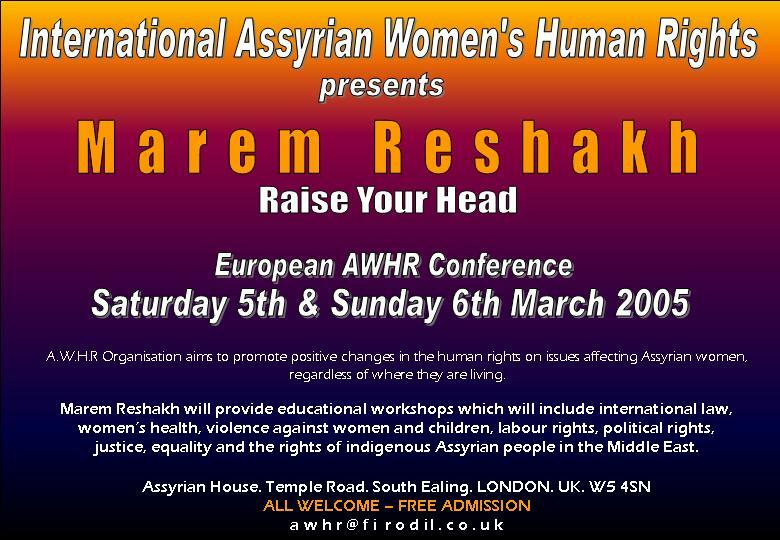 Again, the question arises as to why would Arameans be so chauvinistic about an Assyrian identity? Why would they turn to a glorious memory of a past that was Assyrian, not Aramean? One answer might be that they considered the Assyrian past as their past, in a word, they considered themselves to be Assyrians. In this case how can we prove that those claims are not correct and that they must be counted as Arameans? The authors are saying that Assyria’s aristocracy shared its ethnicity and language with the Aramaic world. Does this mean that Assyria is Aramaic and is inhabited by Arameans? Are the Assyrians of the authors, Arameans? What we see here is SHARING, and to share, you have to have, at least, two entities, or in this case two identities. One identity must be Aramaic, with whom the sharing is made, and the other must be non-Aramaic. Therefore, what the authors mean is that the Assyrians “shared” their ethnicity and language with Arameans, otherwise, the phrase would mean: Arameans shared their ethnicity with the Aramaic world; an absurdity. The more plausible answer to the above apparent contradiction is to interpret it as Assyrians sharing their ethnicity with Arameans, and vice-versa. The key is in the word sharing, which necessitates, at least, two participants, Assyrians and Arameans. In the words of Patriarch Michael the Great, who, in 1136 AD, was consecrated bishop of Anazarbus, wrote that: “Assyrians, that is Syrians”, or to paraphrase him: “Atouraye d’hinoun Suryaye”. This was taken from his Chronicles, translated by J.B. Chabot as: “Les Chroniques de Michele le Syrien.” The more complete quotation reads: "The names of the peoples who have writing among the descendents of Shem are: Chaldeans, Assyrians that is Syrians; the Hebrew, Persians, Medes, Arabs…." The Patriarch is clearly “sharing” his identity with Assyrians. The statement that the Suryane of Nestorian Iraq quite frequently speak of themselves and their language as Aramean can be interpreted as a confusion on the part of the Suryane, not a contradiction of the authors. It should be pointed out that the Suryane in general have been ruled by foreign, and often, hostile governments. They never had a government of themselves that would preserve their history, and national identity. Under such circumstances, it is possible to forget or to get confused. What the Suryane of the authors are confusing is the language with their ethnicity. The Suryane are Assyrians who speak the Aramaic language. The above statements by the authors do not mean that Nestorians are Arameans, because if we interpreted it this way, we would be drawing conclusions out of context. To read its meaning in context we must consider everything that is written above and what will come next. The last two paragraphs, especially, the number 6, seem to contradict all the previous statements, but, that’s if you read them in isolation, out of context. First of all we have the qualifying words “almost exclusively” about the ethnic relationship between Assyrians and Arameans, and then this is followed by the affirmation that the Aramean ethnicity was itself both weak and diffuse. This is followed by another assertion that as Assyrians the Christians of northern Mesopotamia enjoyed an ethnic, social and historical solidarity which was both worldly and transcendental. On the other hand, the authors claim that the Aramean ethnicity was both weak and diffuse. Can a weak and diffuse ethnicity replace the Assyrian ethnicity that the authors repeatedly mention? Evidently, the Aramean connection is not strong in its ethnic sense, but only in the language adopted by Assyrians. Firstly, the authors of Hagarism believe in the survival of Assyrians after the destructions of 612 B.C. Secondly, they clearly state that when the region of Assyria came back into the focus of history, it was with an Assyrian, not a Persian let alone Greek, self-identification. Thirdly, the authors see Assyrians sharing their ethnicity and language with the Aramaic world. They even go as far as saying that the Assyrian aristocracy and peasants were both exclusively Aramean, meaning that they shared their identity, not with Persians, not with Greeks, but exclusively, with Arameans. But, they also say that the Aramean ethnicity of the Assyrians was weak and diffuse. The statement, by the authors, that the Assyrians shared their ethnicity with Arameans, confirms their Assyrian identity, otherwise, “sharing” would become meaningless. They shared their ethnicity exclusively with Arameans. To ignore any parts of the book betrays objectivity. If one places more emphasis on the Aramean identity of the Assyrians, while ignoring the numerous references by the authors to Assyrians, he or she is accusing the authors of incompetence, because, it will mean that they were not clear in their minds or that they were unable to see the contradiction within only a few lines of each other. In times of need, when our people reached for signs of hope and salvation, we witnessed the power of relics and objects in uniting a broken army and a desperate nation. The wooden crosses of our Christian Fathers carried to Far East, the blood of our Martyrs, the books written and translated by our Syriac scholars, and the colorful flag of our national unity are only a few such examples. Today, from the cold and dark lands in Europe, thousands of miles away from our beloved Bet-Nahrain, it is a round ball, kicked around in the arena of sport competitions, that ties us from Australia to Russia, Norway to South Africa. It is for that reason that in a singular voice we declare this truth: You, the Lions of Assyriska, have made us proud to be Assyrian again and proud to be your fans from every corner of the world.